sassyfrazz: Sonicare for kids! A great toothbrush!! Sometimes brushing teeth can be a task that kids simply want to avoid. Sometimes reminding your younger children to brush their teeth can be forgotten. 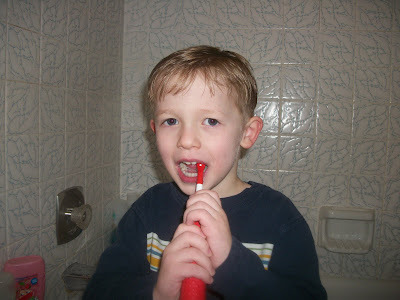 However, having a Sonicare toothbrush makes brushing teeth a real fun time....at least for my (almost) 5 year old. Caleb got one of the Brand NEW Phillips Sonicare toothbrushes to review, and HE LOVES IT!! When Caleb pushed the button to turn it on, he put it on his front teeth, and he giggled. He loved the brushing movement, and liked that it tickled. He moved the brush all around, and he also liked to keep it moving on the front teeth. Then Caleb heard a little tune, and said, "what's that?" I told him that sound was to remind him to move the Sonicare toothbrush to the other teeth. He kept brushing while moving the brush around, and then the toothbrush chimed again. The Sonicare toothbrush has a great gripped handle. 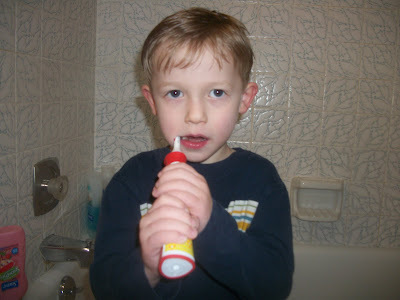 Caleb could hold on to the toothbrush with ease, and if I had to help him out, it would be easy for me to hold on to it. The faceplate on the toothbrush comes with three different covers, so kids can customize how they want their toothbrush to look. Near the brush head, the handle is designed to be able to lay flat on a counter, so it doesn't roll. 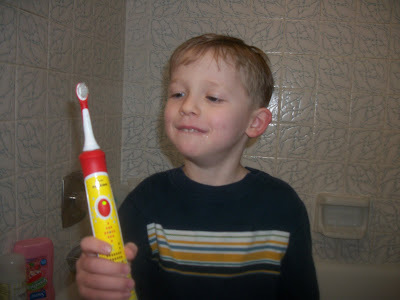 This way, kids can apply their own toothpaste to their brush. 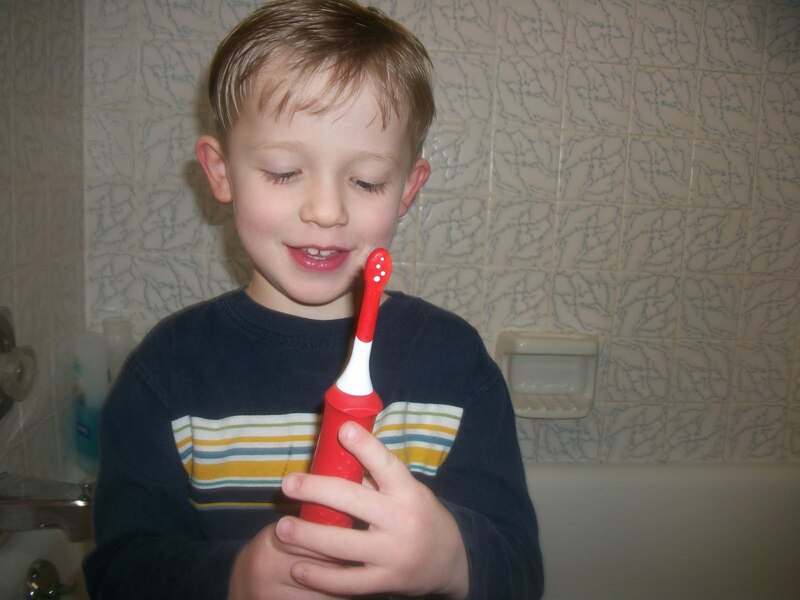 The brush heads are designed for two age groups: ages 4 + is one, and ages 7+ is another. The Sonicare toothbrush comes with both brush heads. The brush head should be replaced every 3 months. On the handle of the brush, there is a button near the bottom that is used for two power modes: low mode for ages 4 + and a high mode for 7 +. The Sonicare toothbrush is also designed with a built in timer. When the toothbrush is first used the timing is less than 2 minutes (which is what dentists recommend for proper teeth brushing). Over time, the toothbrush stays on longer and longer to build up to the 2 minutes. 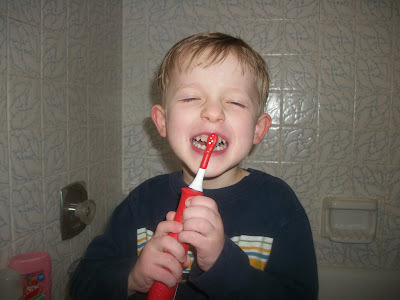 Caleb gets so excited about brushing his teeth now, more so than he when he used his other toothbrush. It is great having the Sonicare toothbrush, because Caleb reminds me that he needs to brush his teeth. I am not so great at remembering to help my little kids with this. So, having the Sonicare in our home has been a great product to have. I love that the Sonicare promotes good teeth care, brushing, and is super kid friendly. I think when Caleb's brush head is fully used, I will let my oldest son try out the brush with the older designed brush head. We give the Sonicare toothbrush two thumbs up! I am sure I will be getting a Sonicare toothbrush for each of my kids! Oh yeah, and the Sonicare toothbrush doesn't require batteries! That is right, it is rechargeable! I love that feature! We can plug in the charger, and put the toothbrush in the base. The toothbrush is always ready for use. The base holds the toothbrush handle, and stores the brush head. The brush head has a cover, as well. Sonicare For Kids is now available at Wal-Marts nationwide, and is also available at Amazon.com and Target. The Sonicare has a 2 year warranty.